Don’t forget that you will be assessing the employer just like they are assessing you. So remember to ask questions at the end of your job interview. 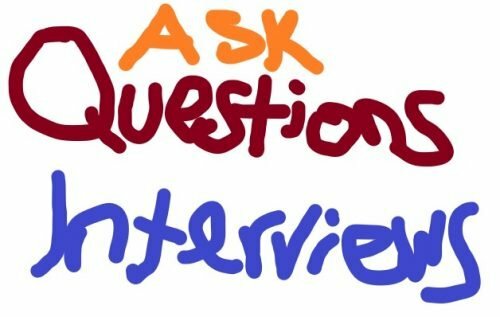 “Have you got any questions for me?” This is what usually interviewers ask candidates at the end of the interviews and they expect to hear some questions from you to see how interested you are with the job. 1. Where do you see the company in three years, and how would the person in this role contribute to this vision? 2. Why has the position become available? 3. What are the main objectives and responsibilities of the position? 4. How does the company expect these objectives to be met? 5. What’s your staff turnover rate, and what are you doing to reduce it? 6. What are the measures used to judge how successful I am in the role? 7. When your staff comes to you with conflicts, how do you respond? 8. What obstacles are commonly encountered in reaching these objectives? 9. What is the desired time frame for reaching the objectives? 10. What can I expect from you in terms of development and support? 11. What aspirations do you have for me at the company? 12. Where will the job fit into the team structure? 13. What’s the best thing about working at your company? 14. What’s one of the most interesting projects or opportunities that you’ve worked on? 15. What is the main thing the organisation expects from its employees? 16. How do you build good relationships within teams? 17. What is the turnover of staff like throughout the company? 18. Are there any plans for expansion? 19. Is this a new position? If not, why did the person before me leave this role? 20. What type of employee tends to succeed here? What qualities are the most important for doing well and advancing at the firm? 21. How would you describe the company culture and management style? 22. I’m very interested in this job and think I’d be successful here. Do you think I’m a good fit for the role? 23. If I was offered the job, what preparation could I do? 24. What do you particularly enjoy about working for this company? 25. Where do you see yourself in five years? 26. If I’m successful, can you tell me what is likely to happen in my first week? 27. Is support available for people who want to gain extra skills? 28. I’m really impressed with your company and I’m confident I could do a great job. When can I expect to hear back from you? 29. How many other people are there in the team? 30. What are some of the problems your company faces right now? And what is your department doing to solve them? 31. How do you help your team grow professionally? 32. How do you evaluate success here? 33. What’s your timeline for making a decision, and when can I expect to hear back from you? 34. Is there anyone else I need to meet with?/Is there anyone else you would like me to meet with? 35. What would my day-to-day responsibilities be? 36. What are the promotion prospects? 37. Do you run any training schemes? 38. What are the company’s plans for the future? 39. How would you describe the ideal candidate? 40. When can I expect to hear from you? 41. How would you describe the responsibilities of the position? 42. How would you describe a typical day in this position? 43. Is this a new position? If not, what did the previous employee go on to do? 44. What is the company’s management style? 45. Who does this position report to? If I am offered the position, can I meet him or her before making my final acceptance decision? 46. Why is this position available? 47. How many people work in this office/department? 48. How much travel is expected? 49. Is relocation a possibility? 50. What is the typical work week? Is overtime expected? 51. What are the prospects for growth and advancement? 52. How does one advance in the company? 53. Are there any examples of a career path beginning with this position? 54. Would you like a list of references? 55. If I am extended a job offer, how soon would you like me to start? 56. What can I clarify for you about my qualifications? 57. When can I expect to hear from you? 58. Are there any other questions I can answer for you? 59. Do you have any reservations about my qualifications? 60. Do you have a policy for helping new members of the team get on board? 61. What are the biggest challenges of this job? 62. What are the challenges of this position? 63. How would you score the company on living up to its core values? What’s the one thing you’re working to improve? 64. What’s the most important thing I should accomplish in the first ninety days? 65. How would you describe this company’s values? 66. Can you tell me what steps need to be completed before your company can generate an offer? 67. Can you give me an example of how I would collaborate with my manager? 68. How has the company changed over the last few years? 69. What are the company’s plans for growth and development? 70. What are the biggest rewards of the job and working for this company? 71. What is the best part of working for this company? 72. What’s your least favorite part of working here? 73. What type of background do you feel would be best suited for success in this position? 74. Who do you consider your major competitors? How are you better? 75. Beyond the hard skills required to successfully perform this job, what soft skills would serve the company and position best? 76. How has this position evolved? 77. Who would I be reporting to? Are those three people on the same team or on different teams? What’s the pecking order? 78. Who do you think would be the ideal candidate for this position, and how do I compare? 79. Have I answered all your questions? 80. If you were to hire me, what might I expect in a typical day? 81. Do you have any hesitations about my qualifications? 82. What do you like most about working for this company? 83. What have past employees done to succeed in this position?